I’ve spent the better part of the last few weeks in a frantic search of old photos for the upcoming second edition of Closer to the Ground. Since I never envisioned doing something like this, I haven’t cross-referenced my photos, so…hours and hours of searching through what feels like a million random photo files. The upside is that it’s been quite a walk down memory lane, as they say. I know it’s another cliche, but I can hardly believe how fast time goes by and how much the kids have grown. I guess when you’re with them every day, you lose track of the little changes. Then you look at pictures from five years ago, and wow. Anyway, in the process of it all, I found this little gem. 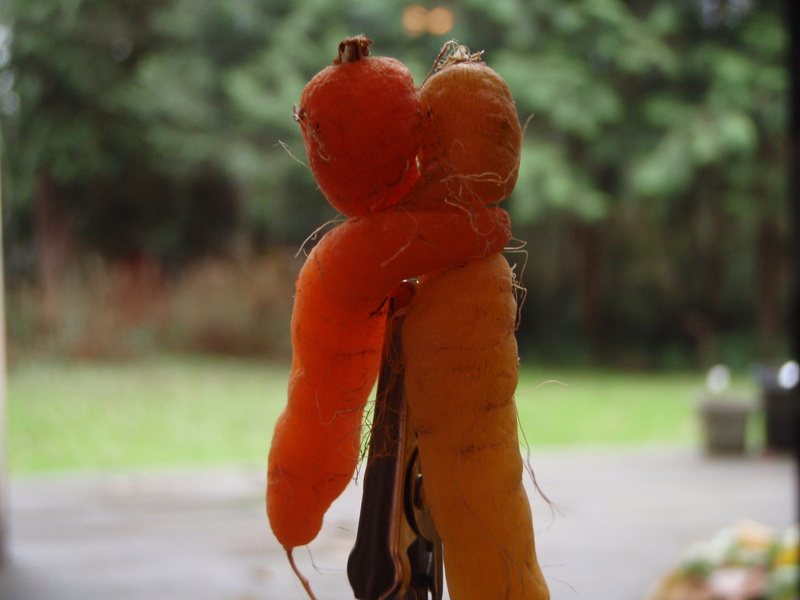 The kids grew carrots in pots out back a few years ago, and what a surprise when we pulled them up. I’m not sure what exactly it means, but it seems important. Or at least funny. Have a great weekend! Seems early, but then, strawberries were two weeks early this year, so I shouldn’t be surprised. 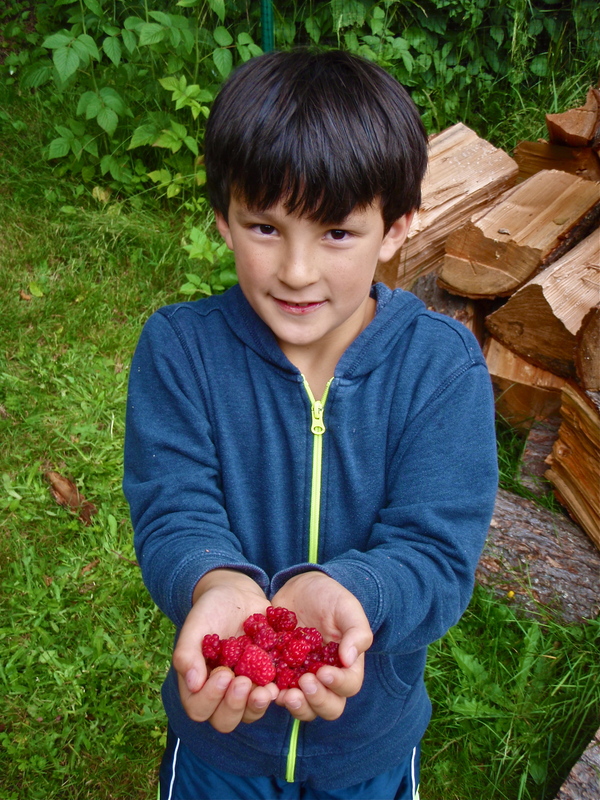 Weston scrounged around our little home patch last night and came up with a few handfuls of delicious, sweet raspberries. The early Summits (grown on the lower sections of last year’s canes), as usual, are small and suffer from “crumbling” but it didn’t deter Weston’s enjoyment one bit. Big, luscious Tulameens are just starting now–two ripe ones in this harvest. I think if I had the time, I’d just do away with the Summits altogether and go with all Tulameens, but it’s a two-year wait for the latter to produce fruit. So even though I say that every year, I’ve yet to do anything about it. All planting/growing arguments aside, we pretty much love any kind of raspberry. And last night’s first fantastic taste just whetted our appetite for more. As I type, Weston is hopefully foraging through the canes with a strong belief that more ripened overnight. I hope he’s right. 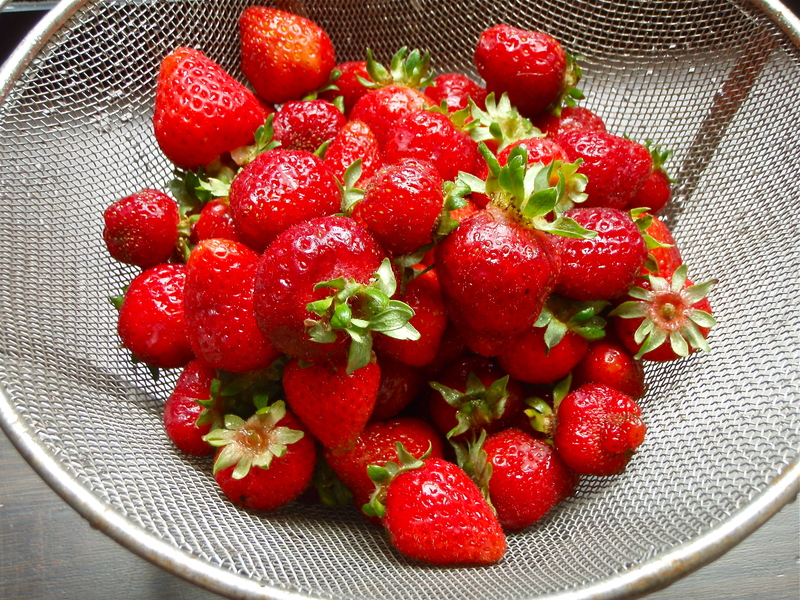 I can’t remember ever having strawberries in May, but Skyla picked these from our raised beds at the farm last week. At our house in the woods, I’ve grown accustomed to “June-bearing” strawberries ripening in July, but the wide-open space (no shade) at the farm seems to make a huge difference. Although we’ve had record rainfall this spring, we’ve also had a lot of sunny days, which may have contributed to the early ripening. Whatever the reason, we’ll take ’em. This batch went into our traditional first-harvest “light” ice cream, made with equal parts half-and-half, 2% milk and non-fat yogurt. A pinch of salt, a dash of vanilla, a little sugar and two-plus cups of fresh berries all go into our little ice cream maker and the result is a luscious, bright, frozen version of strawberries and cream. I could probably eat a gallon of the stuff in one sitting. 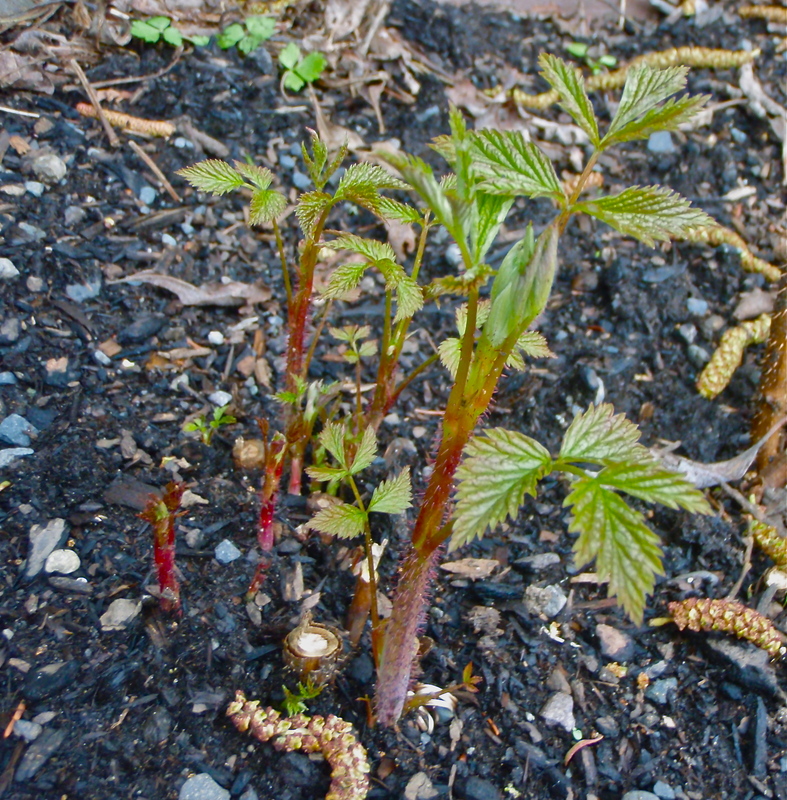 And the berries are just starting to come on strong, so we’ve also been eating plenty straight from the basket, and blending them into smoothies with the kale that’s also growing like crazy now. Fresh, healthy, energy food disguised as dessert. What could be better? Last year, Stacy dug up, or “lifted,” the entire dahlia field up at the farm. Then she spent hours dividing, cleaning and packing the tubers for storage. In the spring, we tore apart the watering system, tilled the soil, rebuilt the irrigation and replanted the best tubers from previous years along with some new ones. Even though Stacy did most of the work, I admit, I wondered if it was worth the effort. When the plants were slow to grow up and flower–normal, we learned for lifting years–I wondered even more. But now, as the flowers grow bigger and more vibrant each day, I find it hard to even walk by without stopping to marvel at their incredible patterns and colors. They light up even the gloomiest autumn weather and brighten the house whenever Stacy brings home a handful for the kitchen table. As U-Pick flowers, the dahlias also help supplement our farm income, and hopefully brighten other people’s homes as much as ours. Was it worth all the work? Absolutely. But I’m happy we don’t have to do it again this year.